The Count of the voting papers starts immediately the polling booths close on the day of the election. This process is carried out in a formal very controlled manner; a description of the 2001 Count follows. "On arriving at the Auditorium, it was noticeable that there was a police presence on every door and only those with passes were allowed to enter. - The counting staff which were led by a Deputy Returning Officer for each constituency and the overall control was in the hands of the Acting Returning Officer, helped by the Electoral Registration Officers. - The candidates and the representatives of their parties to watch and ensure that all was carried out correctly. The foyer was laid out with a stage from which the declarations were to be made"
On entering the main hall, it was obvious that the main hall had been laid in a predetermined manner with trestle tables around three sides. The ballot slips arrived in sealed numbered boxes and were opened in the controlled area and the papers placed on the trestle tables. The counting staff were sitting around the inside of the open square and the political party observers were sitting opposite, desperately trying to see the number of votes that were coming out of each box. When each box was emptied, it was held up to show to the political observers that there were no papers left. The counting staff then, Verified them, by unfolding each voting slip and piling them up in front of them. When 50 papers were reached an elastic band was placed around them and these were taken back to the centre of the room to be mixed with those from other boxes. When all the verification had been completed and all the counting staff were sitting with clear tables in front of them, the count proper started. The bundles were taken back to the counting staff, who removed the elastic bands and sorted the slips into different piles for each candidate. When a pile reached 50 a coloured "clothes peg" captured them and they were taken to tables next to a centre aisle, which were colour designated for each political party. When 20 bundles were counted a card with "1000" was inserted. All this was seen and checked by the candidates and the agents, who watched anxiously as these piles increased along the table, seeing how long their "snake" was compared with the neighbouring tables. Towards the end of this process the candidates and their agents were called into the restricted area by the Deputy Returning Officers to look through the spoilt and doubtful papers to agree those OK to go forward. Voters must put an X against their candidate with no other marking. Those marked with a "tick" were accepted but any extra wording made them invalid. "Up the Mariners" for instance caused rejection! 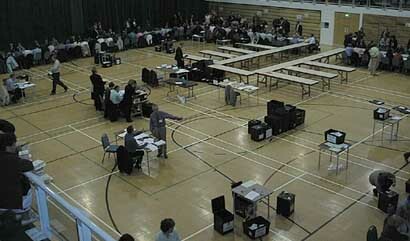 Postal votes had already been counted and agreed. No recount was required as there were not any disputes as to the results. When all had been completed the Acting Returning Officer announced that the result for that particular constituency was about to be declared in the foyer. The Great Grimsby declaration was carried out first by the Returning Officer for Great Grimsby who is the Mayor. The winning candidate then gives an acceptance address thanking their supporters and the officials for their efficiency. It is also traditional to commiserate with the losing candidates who then speak in order of their results to give their thanks and other comments. 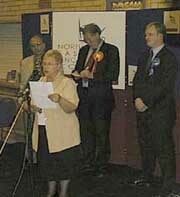 This was followed by the Cleethorpes result at which the following recordings were taken.